It’s funny, because it’s true. 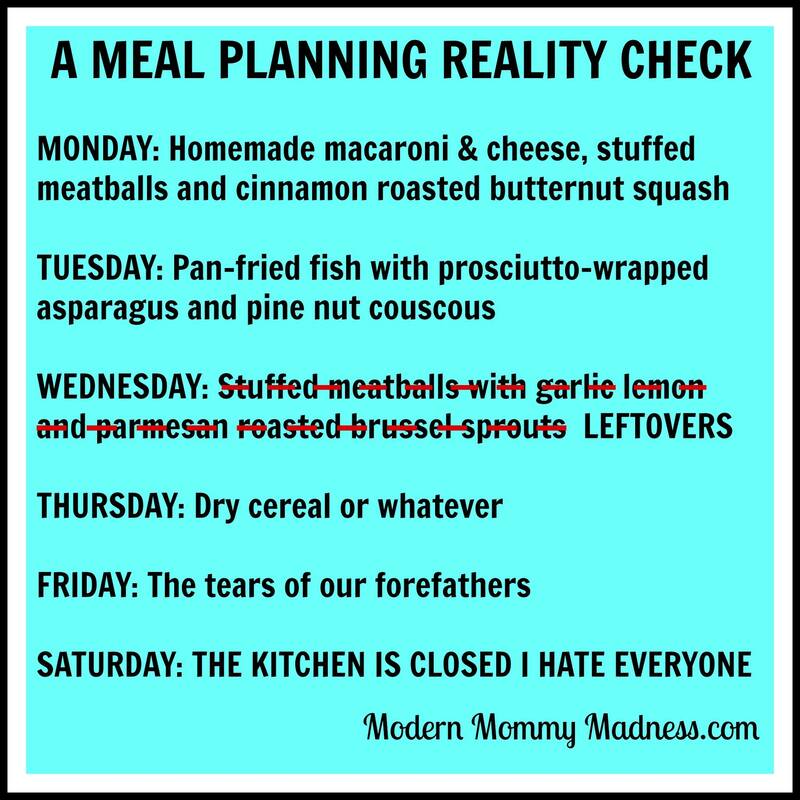 I can’t tell you how many times I’ve planned the perfect menu, filled with wonderful, healthy, perfectly-balanced meals, containing a variety of colors, textures and flavors each and every night, only to crash and burn by Wednesday. Rule #1: Always check the calendar before making a menu plan. What nights do I have more/less time to cook? Are there any nights that require grab-and-go meals? Am I going to be home in the hour or two before dinner time and available to cook? How many people will be home for dinner and at what time? Can the kids help that night with something simple? The answers to these questions determine what meal I plan for any given night. For example, Wednesdays are my kryptonite for two reasons: first, I take advantage of the extra time for cooking that I have Mondays and Tuesdays by cooking more complicated recipes and by prepping extra food for the rest of the week. This means that by Wednesday I’m on my way to being burned out on cooking. Second, Wednesdays are the most complicated kid drop-off/pick-up night for us. I spend most of the dinner hour in the car with my two oldest girls, while my husband is at home serving up dinner to the younger two kiddos. I eat when I get home, then he heads out to pick up the girls from their activities. The older girls may or may not eat before and/or after their activities. If you follow my menus, you’ll notice that Wednesdays are usually simple, fast, easy meals, generally breakfast for dinner, a salad bar, or something from the slow-cooker. A few weeks ago I got crazy and planned sautéed chicken and fancy mac-n-cheese. Not a great idea, especially since my husband was out of town. Guess what happened? I barely got the mac-n-cheese ready and then we all had to head out the door. Grrrrr. Lesson learned…..again. Rule #2: Know your limits. This goes hand-in-hand with Rule #1, because clearly you are limited by what is on your calendar for the week. But you have other limits. For example, though I love to cook, I only love cooking when I get to do it on my terms: in a quiet house, some light classical music playing quietly, and most importantly, no interruptions. Want to know how many times that exact scenario has played out in the last 14 years?!?! Now, I have learned to like cooking in my more realistic setting which includes a very loud house, some teen-bop or 80’s music playing quite loudly, and interruptions too numerous to count. But I certainly don’t love it, and I find that my like diminishes rapidly by about mid-week. By Thursday I am generally in no mood for a new recipe with an ingredient list a mile long, requiring lots of prep-work, browning, simmering and/or chopping (unless I did the prep-work earlier in the week). It’s less about cooking, and more about just getting food on the table. Any meal I plan mid- to late-week is going to be a simple family favorite or will involve leftovers. Rule #3: no more than one recipe that requires active, hands-on cooking is allowed on a given night. If I’m sautéing chicken or pork chops, the vegetable will not require much actual cooking. Most likely it’ll be greens added into the sauce, or frozen broccoli warmed up in the microwave. However, if my entree has been in the slow-cooker all day and I have some extra time, I might spend some time peeling and dicing a variety of root vegetables to roast in the oven…..and if I’m feeling really ambitious I’ll chop up a bunch of veggies to make a salad bar as well. That’s it. Three simple rules to follow to ensure a successful menu plan. Keep them in mind next time, because no one really wants to eat the tears of our forefathers on Friday night, or any night for that matter! Great tips and all sooooo true!! Love the menu image at the top… Hilarious! !